Few would dispute the important role that judges play in our state, and the necessary service they provide to our society. Judges preside over the most significant matters—criminal trials and sentencing, parental terminations, complex business lawsuits and significant civil actions with catastrophic injuries and large payouts. In recent years, the complexity of cases in New Jersey state courts has increased. However, the salaries of judges have not only not risen, but have been reduced when measured against the cost of living, and the actual take-home income of judges has been reduced by virtue of pension and health insurance contributions made by judges. New Jersey has the third highest cost of living of all states in the nation, a cost of living which continues to increase. Yet, state court judges in New Jersey have not received a raise since January 2008. For comparison’s sake, in 1974 a Superior Court judge’s salary was $40,000, which translates to $192,564.71 in 2015, when a CPI inflation analysis is applied. By 1991, a Superior Court judge’s salary “rose” to $100,000, but the buying power of that salary fell to $174,255.51, based on 2015 dollars, according to the CPI inflation analysis. In 2007, the salary “rose” to $157,000, but fell to $173,066.57 when adjusted to 2015 dollars. The current salary of Superior Court judges—$165,000—has a buying power of $182,534.67 in 2015, based on the CPI adjustment. Thus, since 1974, the buying power of judges’ salaries, when adjusted for inflation, has been reduced by approximately $10,000. Given the continued erosion of the real value of state judicial salaries, the time for another raise has come. The National Center for State Courts has published information regarding state judicial salaries based on the cost of living. According to the published information, as of Jan. 1, 2015, although New Jersey ranks tenth highest in judicial salaries ($165,000 for the Superior Court), it ranks twenty-third when that salary is adjusted for cost of living ($135,881). For the sake of comparison, judges in Arkansas, where the cost of living is significantly lower than in New Jersey, make $140,372, yet their salary when adjusted for the cost of living is $148,337, exceeding that of New Jersey judges by over $12,000. The national average of judicial salaries, adjusted for cost of living, is $146,847—almost $11,000 more than the cost-adjusted New Jersey judge salary. Additionally, Federal District Court judges make $203,100 as of 2016, and their salaries also rise to reflect changes to the cost of living each year. Moreover, the take home pay of judges has actually been decreased, due to the 2012 voter approval of an amendment to the state constitution requiring judges to contribute more to their pensions and health insurance. This voter referendum overturned the court’s decision that such contribution constituted diminishing judicial salaries during a judge’s term of appointment. Based on this amendment, the amount of contributions judges must make to the pension system rises from 3 percent to 12 percent of their salaries by 2017, bringing a judge’s pension contribution from around $3,300 to $18,000. This dramatic increase means that judges now pay the highest percentage of their salaries of all public workers. Additionally, the amendment raises judges’ contributions to the health plan from 1.5 percent of their salary to 35 percent of the cost of coverage over four years. These changes amount to a total decrease in judges’ take-home salary of about $17,000, or 10 percent of their income. The New Jersey Civil Service Commission’s 2015 Fiscal Report noted 1.0 to 1.75 percent salary increases for certain state workers in 2015. Additionally, in 2013, salaries of public employees in New Jersey rose $360 million, while the judges’ salary continued to remain stagnant. Certain state employees at large public universities make much more than judges—up to $2 million per year with $100,000 annual increases and annual performance incentives. Additionally, even with the current cap on superintendent salaries imposed by Governor Christie, some superintendents receive annual compensation in excess of $225,000. Some local police chiefs have annual compensation in excess of $200,000—before additional benefits such as overtime and accrued sick leave, which are not available to judges. Further, the 2015 budget for the judiciary was a mere $692.4 million in a $32.5 billion State budget, amounting to only about 2 percent of the total State budget. Thus, an increase in judicial salaries would not be a burden upon the budget, and the importance of the branch of government is certainly more than its percentage of the budget suggests. This underpaying of our judges creates a risk that the judiciary will transform into a branch of the government with very little diversity of experience among the individuals it attracts to the bench. Without salary increases, only those who have already attained wealth, those for whom the salary is a raise (such as public service lawyers), and lawyers using the judgeship as a career stepping stone, will consider becoming a judge. That is not to say that any of these paths to a judgeship is not worthwhile, but an important aspect of the judiciary is the diversity of the judges and their ability to represent a variety of professional backgrounds. To encourage such diversity, we must pay judges enough to make a career as a judge economically feasible for a variety of backgrounds. Certainly judicial aspiration, like all public service, means economic sacrifice, and judges are not unaware of that reality. Underpaying judges, however, threatens the very efficacy of the judicial system. As most people have experienced at one point or another, it is more difficult to work hard and produce quality work when the value of that work is undervalued. Consider that in New Jersey, a law student working at a large law firm for a summer can make up to $3,080 per week (or over $150,000 on an annualized basis), and a starting first-year associate coming out of law school can make $160,000 per year at some firms—an amount startlingly close to the $165,000 Superior Court judges make after years of experience and with decisions affecting the lives of countless individuals in their hands. As a result, during the three years before the last pay increase in 2008, 47 judges resigned before mandatory retirement—a problem we risk again at this juncture if salaries are not raised. The decrease in judges’ salary risks discouraging certain lawyers from accepting judgeships, and encouraging sitting judges to leave the bench for high-paying careers in the private sector. Like all of us, judges who support families face difficult decisions when faced with challenges like high college tuition and the rising cost of living in New Jersey. These judges serve all of society, from the poorest citizens to the largest corporations, yet their salaries do not reflect this value. To maintain a diverse, robust judiciary, we must draw the brightest, most pragmatic and most intelligent judges to the bench. 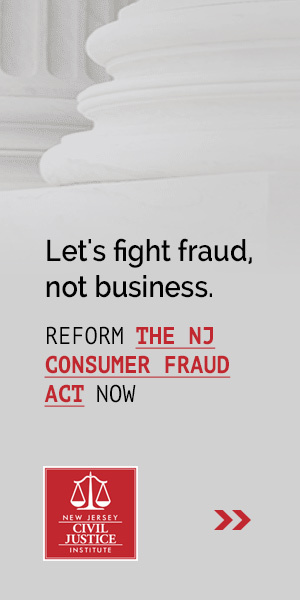 As judges cannot speak for themselves in lobbying for this change, we urge others to support the hard work that these judges do, and continue to demonstrate the importance we place on fairness, equality before the law, and justice in New Jersey. New Jersey has a highly competent and independent judiciary, and the men and women who make it so deserve a fair compensation for their service to New Jersey. The failure to pay the members of the judiciary the fair and reasonable compensation to which they are entitled, coupled with the contributions that members of the judiciary have been required to make to their pensions and health insurance, surely has a substantial negative effect on the morale of the judiciary. Fair compensation will lead to a stronger, more diverse judiciary that can better serve the complex needs of our state. Marcus Rayner is the president of the New Jersey Civil Justice Institute. David Kott is a partner at McCarter & English and a Certified Civil Trial Attorney. Reprinted with permission from the February 1, 2016 issue of the New Jersey Law Journal. © 2016 ALM Media Properties, LLC. Further duplication without permission is prohibited. All rights reserved. Click here to download a .pdf of this op-ed.